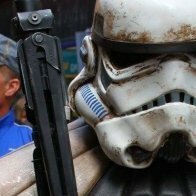 Jack Copestake TD 21867 https://www.501st.com/members/displaymemberdetails.php?userID=26870 Respectfully requesting sandtrooper access. I’m already on the 501st. Please let me know if there is anything else I need. I’m very new to this and this is my first costume just awaiting the nod for the police officer program!! MERRY CHRISTMAS!! Hello all, TD 21867, Jack from United Kingdom, Derbyshire. Cleared for the first time ever! Just awaiting reply for my MEPD clearance and I’m all done. Looking to do my induction in Exeter next February or Birmingham in March.